Craving A Summer Poolside Concert? Or Perhaps A Stay-Cation in Carlsbad? 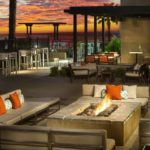 This article focuses on two wonderful summer events…1) Summer Concert Series By The Pool, and 2) A Stay-Cation at a gem of a resort in Carlsbad! 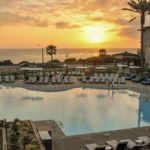 Whether it’s just for a two-hour poolside concert, or a quick overnight getaway, you can resort to some incredible fun at the Cape Rey Carlsbad- A Hilton Resort! Listen up Southern California! 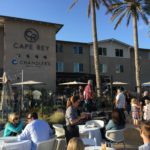 You might be a local from North County, downtown San Diego, or a nearby visitor from Orange County and points north—-Carlsbad has a hidden little gem of a resort. The secret is now out. Imagine a live band or solo artist poolside, delicious dining on the terrace, cocktails by a cozy fireside conversation pod. Or better yet, how about a sneak-away staycation? It’s all right here at Cape Rey in Carlsbad. This classy, sassy resort has aptly blended the charm of a beachside escape, with a hip, modern vibe. Accented with sleek lines, and splashes of bright colors, it is a cheerful spot to just “press pause”. 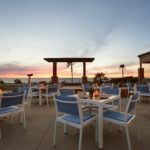 They have a perfect recipe for R&R, including: excellent cuisine, craft cocktails, local brews, a spa, dramatic ocean views with a pool-centric layout. 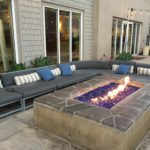 When built, the property was smartly elevated about five feet, to offer commanding views of the ocean just across Carlsbad Boulevard. And the resort is a manageable size, which I prefer. What’s not to love here? Summer Concerts By The Pool- On a recent visit to Cape Rey Resort, I was here for their “Summer Concert Series”. The live band, Steal Dawn, was excellent, playing everything from Maroon 5, to Bon Jovi, Beach Boys, and all my favorites! Everyone was singing along, and some even started dancing in front of the stage. It was so much fun with the ocean as the perfect backdrop on one side, and the azure pool on the other. We enjoyed the music from lounge chairs which was the perfect end to a long week. The music plays from 5:30-7:30pm on the last Thursday of each month during the summer months. We were able to order delicious appetizers from Chandler’s restaurant. 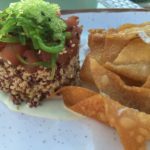 We enjoyed the super fresh Capeside Poke (Sushi grade Ahi, rainbow quinoa skirted around the stacked poke, with a Thai Chili Aioli, cucumber marinade seaweed, lime and ponzu sauce). We also enjoyed the Crispy Calamari which was light and served with dipping sauces. The Artisan Cheese Plate was a perfect option for nibbling. 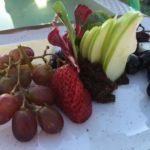 The plate included: a fig mostarda (a sweet and spicy Italian condiment), local fruits, Lavosh crackers and toasted Artisan bread. Guests can order from a happy hour menu (available from 3:00-6:00pm 7 days a week) and the resort has live music playing each week Thursday, Friday and Saturday evenings. 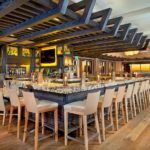 Guests can order from a happy hour menu (available from 3:00-6:00pm 7 days a week) and they do have live music playing each week Thursday, Friday and Saturday evenings. Sister Speak- June 30th http://www.sisterspeakmusic.com/ This duo playing vocals and a guitar with a blend of acoustic, melodic, blues and world pop. Otto Pilot- July 28th http://www.oplivemusic.com/ A brother duo from San Diego playing guitar and singing a great blend of acoustic alternative rock. Funk Shui Planet- August 25th http://theacousticspot.com/artists/funk-shui-planet/ A four-piece band playing instruments that include: guitar, sax, bongo and other percussions featuring music of the pop, funk and soul genres. Aquile – September 29th http://www.aquilemusic.com/ Aquile is a solo singer and songwriter who plays guitar and was a 3-chair turn and participant in The Voice. His style is reminiscent of John Legend and released his first album, CONTROL in 2013. 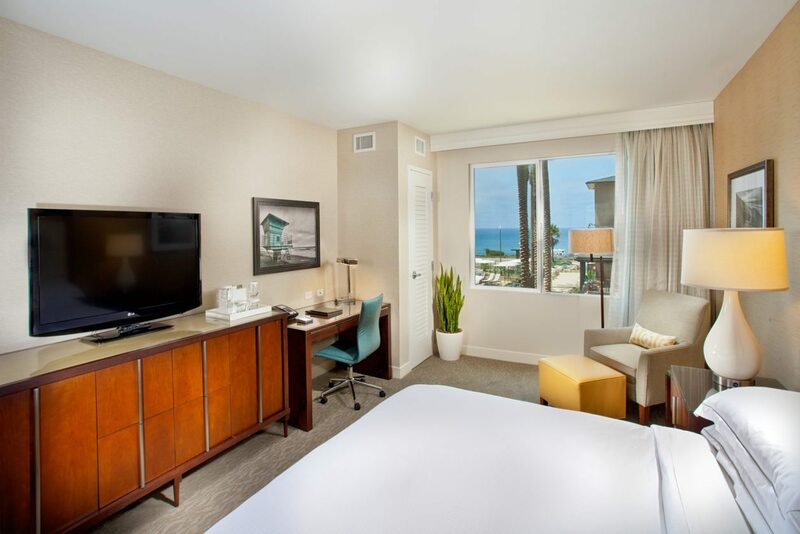 Stay-Cations Are So Close At Hand From ocean view suites, to balcony & pool view rooms these luxurious craftsman and ocean inspired guestrooms are just the perfect spot to take a break. Each guestroom includes: a mini-refrigerator, microwave, in-room coffee, 42″ flat-screen TV, in-room safe, high-speed Internet access, iron & ironing board, and robes & slippers. During July and August, room rates start at $249 mid-week and $279 on the weekends. 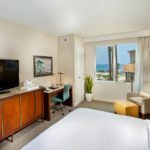 Guest room suites, and rooms with ocean views are of course, at a higher price point. A Business Center, complete Spa, Fitness Center, Pool, Bar and upscale restaurant are all here to enjoy. 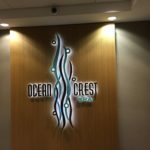 Ocean Crest Spa Inspired by the healing powers of the sea, the spa utilizes naturally-sourced products and make appointments for massages, facials, body treatments and nail care. 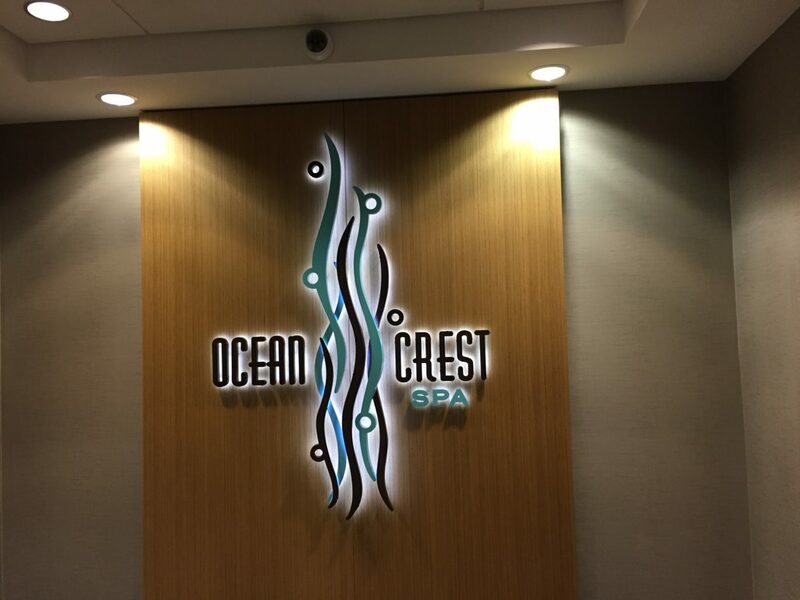 One step inside the spa, and relaxation takes hold. 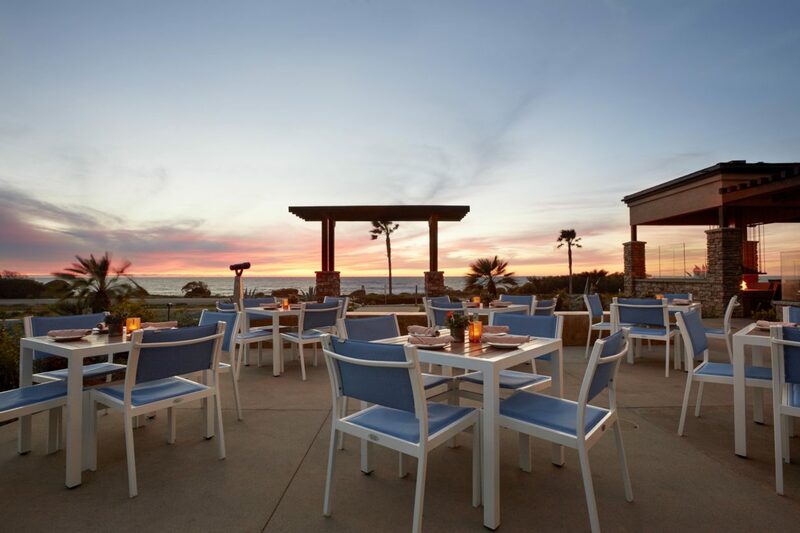 Chandler’s Oceanfront Dining & Bar This is self-described as a local, coastal, unexpected dining experience serving up regional cuisine and using only the freshest of ingredients. The dinner menu features some impressive shared plates, which I always enjoy sampling. There are pizzas, soups & salads, side dishes, and main entrees including: burgers, daily seafood, Jidori chicken brined in whiskey, salmon, and Prime rib eye—-just to name a few. And of course—some hard to resist desserts. The outdoor terrace has been expanded showcasing views of the pool, greenery and ocean. This creates a resort-feel to the dining experience. Dining and Beverage Specials- Pick Your Day! beers and appetizers that are perfect for sharing. Did Someone Say It’s Play Time? Activities At The Resort- Lounge by the pool, splash and swim—and for some serious poolside lounging, there are Private Cabanas which can be rented by resort guests (seven days in advance). Get a massage in the Spa, workout at the fitness center, play at the Kid’s Rule Game Room with Wii and Jenga, enjoy Saturday evening Fun Flicks Movie Night, rent bicycles from the Resort, Brunch at Chandler’s, snuggle up to an evening fireside, toast to happy hour nightly, live music Th/F/Sat on the Sunset Terrace, live band the last TH of the month poolside, or how about a chef prepared picnic for those back to nature outings. At The Beach– Guests can just stroll across the street and have toes in the sand in moments! The Resort can also arrange one of two easy, peasy, activities. The first is Beachside Dining. The Chef will arrange for a four-course meal on the sand, with a bonfire, s’mores and all the goodies. Or, the Concierge can arrange for a Beach Pack. This includes: an umbrella, two chairs, towels and bottled water. Just “show up”! Hats and sunscreen can be found at the gift shop too! In Carlsbad and Nearby- This town is really referred to as a village, and it is quite charming. There are restaurants, shops, boutiques, and lots of people watching. 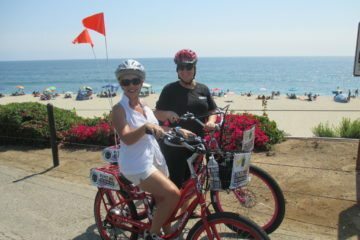 Guests can rent electric Pedego bikes in town for a super-fun bike tour (and the hotel will provide the transportation to get you there and back). Carlsbad State Beach has miles of pristine coastline just steps from the resort. There is Legoland for the younger set, and tide pool exploring at Swami’s. 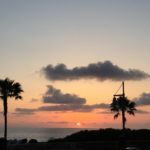 There are hot-air balloon rides, craft brewery tours, and nearby beach towns to explore, such as: Oceanside, Solana Beach and Encinitas. For water sports enthusiasts, there is: kayaking, paddle boarding, surfing, jet-skiing and even deep-sea fishing. No one dare be bored here, right? 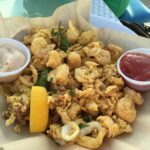 And just a half hour or so south there are lots of places to explore, such as: Sea World, downtown San Diego, Little Italy, Seaport Village, Coronado Island and the historic Hotel Del Coronado (built in 1888 in the Victorian style and worth seeing!). Balboa Park is filled with beautiful grounds, botanical gardens, museums and one of my favorite spots is The Prado at Balboa Park restaurant with a lovely bar and outside terrace under a lush garden canopy. Did Someone Mention a Celebration, Wedding, or a Meetings? This is also a perfect setting for a party or business function. 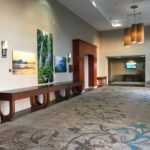 As I was walking around the resort to explore, I was so impressed with the group space for meetings and special events. They have great meeting space on the north end of the property, with a thoughtful selection of flowers and plantings. The gardens are lovely. An expansive outdoor terrace has views of the ocean and I can just picture guests enjoying the sunshine during a meeting venue, or a perfect spot for welcoming guests to a wedding reception or social function. I like to see larger groups in their own enclave at a hotel, as opposed to all over the property. This was very well thought out, indeed. The Cape Rey Resort is literally five minutes from the freeway. 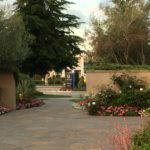 On a recent visit we headed down from Orange County and it only took us 50 minutes at the height of traffic, and yes we cheated and used the Toll Road, which shoots us right out at San Juan Capistrano. Another very viable option is to take the train down to Carlsbad. From Orange County, visitors would take the Amtrak or Metro to Oceanside and then transfer to the Coaster and exit at the Poinsettia Station in Carlsbad. Guests can actually walk from the station to the resort. It is approximately a mile and all level sidewalks. Guests staying at the resort can also call the Concierge ahead of time to arrange a pick-up, and the hotel can also pick up from Oceanside if visitors don’t want to make the transfer.